Justin's Blog » Blog Archive » What Happened? . Last night I witnessed the worst WVU basketball in my lifetime. WVU lost 62-39, at home!! WVU hasn’t scored less than 40 points since February 6, 1980. This was the 2nd lowest scoring game for WVU at the Coliseum. According to the box score we only made 11 shots. We were 10/50 from the field, and 1/22 from the 3 point line. If we had not gone 18/24 from the free throw line (10/10 from Nichols alone), we would have been ever worse off. I’m not not sure what was wrong, but I hope we can shake it off and get back to playing ball like I know we can. 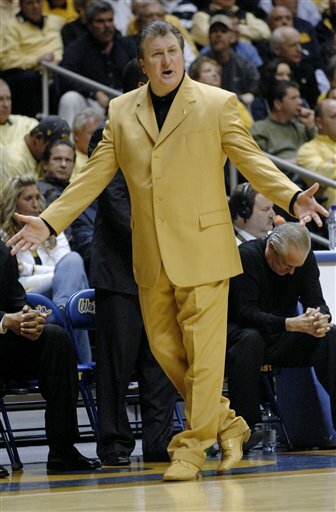 If any good game out of the game it is that coach Huggins got a new gold suit. This man has quite the sense of style.